Blair Keltner focuses her practice in health care litigation. She is involved in all aspects of the litigation process, and drafts pleadings and motions, conducts research and attends hearings and depositions on behalf of her clients. 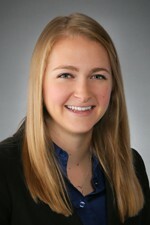 Ms. Keltner joined Hinshaw & Culbertson LLP as an associate in October 2015. Previously she was a law clerk with the firm since 2013. During law school, Ms. Keltner was selected Editor-in-Chief of the Southern Illinois University Law Journal. She was also a teaching assistant for the first year research and legal writing course. Ms. Keltner is a member of Phi Kappa Phi and received numerous awards during law school including, multiple CALI Excellence for the Future Awards, the Law Honors Scholar Award, and the Academic Excellence Award. Texters Beware: Analyzing the Court's Decision in Kubert v. Best, 75 A.3d 1214 (N.J. Super. Ct. App. Div. 2013), S. Ill. L.J. (2014). The Best Offense Is a Good Defense: Examining Failure to Conciliate as an Affirmative Defense in Employment Discrimination Cases Brought by the EEOC, S. Ill. L.J. (2014).